As we advance into the 21st Century, we will see more and more reissues of recordings from the 1950s. (Many copyright restrictions on sound recordings expire after fifty years.) This is good news for those of us who love the early LP era. The performances on this new CD were recorded in 1950 and issued on two separate LPs – not 78-rpms. That doesn't mean that they naturally sounded better. Producer and transfer engineer Roger Beardsley writes that the Schubert LP always was nearly impossible to reproduce with satisfactory results. He guessed that the original cutting stylus was defective and so he tried a custom-made reproducing stylus, instead of the usual conical or elliptical styli. There has been a big improvement in the sound, and Beardsley claims that listeners previously familiar with Decca LXT 2533 (the first release number) will now hear it "in all its glory." Elsewhere, Beardsley relates that LP recording engineers had difficulty with equalization curves until these were standardized for the recording industry. "Only owners of the most sophisticated equipment could get the best out of [early LPs]," he writes. Needless to say, Beardsley also has compensated for these limitations. The sound on this disc is wonderfully warm, not "wiry," as it once was. Unfortunately, Beardsley has not been able to remove the ever-present surface noise on these LPs. There's a continuous rumble throughout the CD, rather like someone operating a power generator next door. It didn't bother me too much (I still play old LPs on my own), but it will trouble more sensitive listeners. I can't praise these performances too highly, though. 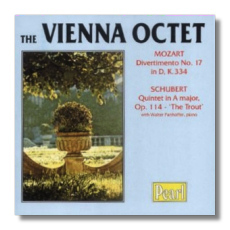 The Vienna Octet, formed in 1947, and active in various incarnations for many years, produced a superb series of chamber music recordings for Decca. These Mozart and Schubert recordings are two of their earliest. The Octet's members placed a high priority on a full singing tone, honeyed legato playing, and warm, genial musicianship. These recordings have plenty of Viennese "schmaltz" to them, a style that is all but absent today. (No wonder that Boskovsky later became his generation's finest conductor of music by the Strauss family.) If you want to love this music, this is the place to come to. One caveat: consistent with the practice of the time, some repeats are ignored in the Divertimento, and there are two cuts – one small and the other rather large – taken in the Rondo finale of that same work. This, then, is not "authentic" Mozart, but it, like the Schubert, is authentically loveable.